By Joydeep Bhattacharya in E-Commerce. Updated on September 6, 2018 . E-learning market has shown a humungous growth in the past 5 years. From college students and stay-at-home moms to retirees and even regular company employees, millions of people are now depending on online courses to ramp up their skills. Going with the trend, a lot of learned individuals join the e-learning bandwagon as a teacher or mentor and share their knowledge with online learners. They work hard to create a course, but when it gets rolled out in the market, they don’t get the desired response – sometimes, no response at all. Well, this problem can be solved if you know how to properly manage and promote your online course. So, in this article, I’ll give you some tips to better create, manage and promote your online course, so you can make your online course a best-seller. Read on to know more. To create an online course, you’ll need a learning management system (LMS). LMS software help you create, manage, and deliver online courses and are widely used in knowledge industries such as healthcare, education, software development, law, etc. With this regard, Kajabi is a good LMS for beginners and as well as established online content entrepreneurs. This tool packages every feature you need to create, host, and distribute online courses in an easy to use interface. Kajabi’s preset landing pages make it easy for you to set up the landing page for your online course in a jiffy. Then, you can use sales pages, thank you pages, squeeze pages, home pages, and download pages, all via preset templates. 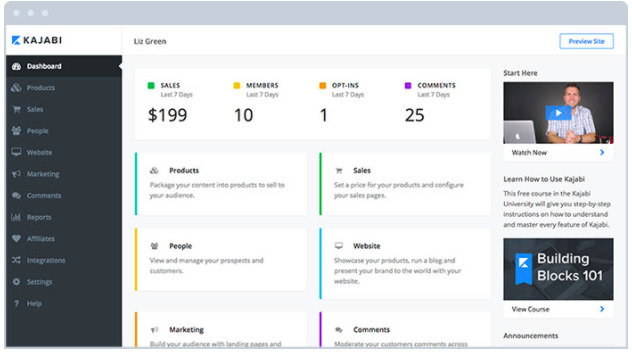 It helps you build a mailing list via your landing pages; users add their email ID in exchange for freebie content, and you get a lead to market your content to. Apart from a learning management system, you will need other enabler tools to create online content with ease. Among these, cloud storage solutions are at the forefront, letting you store all your valuable digital course content online, for free access anywhere, and without worrying about safeguarding content on disks and drives. With cloud storage options like Google Drive, Dropbox, and Box you can safely and easily enable collaborations on shared documents. Brainstorming on new content ideas. Sticking to the content creation schedule. Creating assessment material, and then conducting assessments. Proofreading the content for typos and errors. Before operations become a mess, bring in an intuitive and powerful project management and collaboration tool such as Trello. 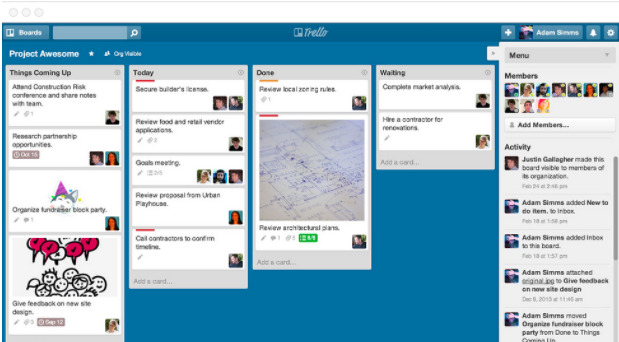 With Trello, you can leverage its ‘boards’ and ‘cards’ to create mini-projects. With boards, you can define independent projects/task/etc., and with cards, you can define the tasks to be performed within a board, with due dates, assignees, etc. Also, collaboration is at Trello’s core, so for online education businesses with growing teams, this is a terrific tool. Your online course content needs to pack a punch, as does the marketing material you use to promote it. This is where Canva comes to the fore. This online design solution connects you to an ever-expanding library of more than a million stock images and designs. Creating flyers, pamphlets, posters, banners, brochures, infographics, apart from mind maps, Venn diagrams, histograms, pie charts, and bar graphs – it’s a breezy affair with Canva. And, for beginners, the great news is that it’s free, albeit with some limitations. Moreover, if you wish to share stock photos directly across your social channels then platforms like Burst can be a good choice. Webinars are the heart and soul of your e-learning business. You just can’t afford to go wrong with your webinars, right from the content plan to course delivery. With regards to creating engaging webinars, ClickMeeting is a great tool. It helps you organize productive and flawless webinars without constraints around device, OS, or browser compatibility. You can also brand your webinar events like a professional with custom invitations, branded registration pages, and waiting rooms. 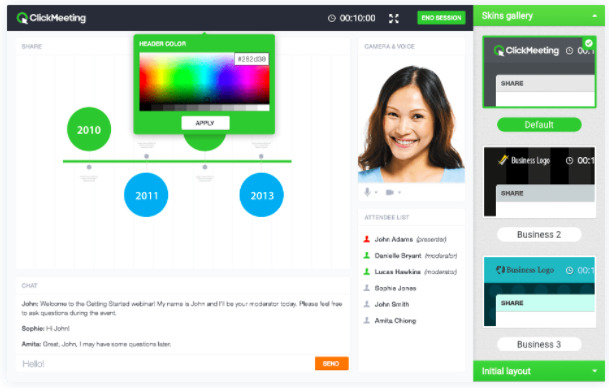 Webinar features include presentations, whiteboards, audio mode, polls and surveys, screen sharing, and even a toll-free number. Its analytical capabilities help you with webinar and attendee stats. Then, you’ve got webinar storage, thank you pages, and webinar recording options. Your prospects will need time before they can press the Subscribe/Attend/Pay Now buttons. Take advantage of your successful course from the past to create promotional material for top of the sales funnel activity. As they start engaging with your brand, surveys, social content shares, and blog post comments, etc., will slowly lead them to the bottom of the pipeline, where they will readily pay for your content. Upload 10-20% of your course videos on YouTube and market your channel. Pay some freelancers to transcribe your videos, and convert the transcripts into a readable long-form blog post as well as several short-form social media posts, linking to your landing pages. Extract audio from your webinar videos, and convert them into podcasts. With so much content available in so many formats, you can easily ramp up your online course brand’s digital marketing via backlinks, email marketing (freebies), blogging, and social media posts. With the e-learning market growing by leaps and bounds, it is the perfect time for you to raise your game and take your online course business to the next level. With the tips, tools, and methods shared in this guide, you can quickly scale up your online course content creation and promotion campaigns. So get started today.